Well, this book was ... an accident? I finished 10% Happier, but I had a long car ride the following day and had nothing to listen to. Next thing I knew, I was going through the library's list of available digital audio books and most of the books I really wanted to read were checked out (boo). When I came across this title, all I could remember is that "it's a classic", and that was good enough for me at that moment, so I checked it out and started listening. I knew nothing about the story at all, and it turned out a very different style than I was expecting. 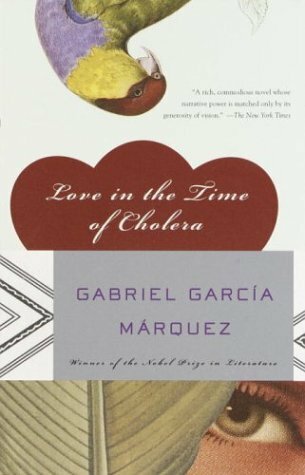 Love in the Time of Cholera is set somewhere along the Caribbean coast in South America (the location is never disclosed) from approximately the 1880s til the 1930s and tells the story of many different "loves". The main strain of the story is that of Fermina Daza and Florentino Ariza. Florentino is poor and falls in love with Fermina Daza at first sight ... when he is about 14 and she is about 12. Yeah, it kind of lost me right there if you can't tell. I'm not a fan of teenage romances. Anyway, synopsis first, opinion later. Fermina and Florentino carry on a clandestine correspondence for several years before their love is discovered and Fermina's father takes her away to try to rid her of Florentino. Florentino pines for her the whole time she is gone, but when she returns as a mature 17 year old she sees him once in the market and realizes how ridiculous her little love affair was and breaks it off. This launches Florentino Ariza into a sort of self inflicted physical malady - his emotions are so strong that he becomes physically ill. He convinces himself that he will get Fermina Daza back one day though because they are meant to be together. He believes this even after she marries a very wealthy and respected doctor, Juvenal Urbino. Femina has a long and happy marriage to Juvenal Urbino, until his sad death in his early 80s. Meanwhile, Florentino Ariza sleeps with every woman he can find, but never commits to any of them because he always feels that he is technically the property of Fermina Daza. After her husband's death, Florentino starts coming around Fermina, slowly acclimating her to his presence until one day she decides that their youthful love really was something and it's a chame to deny it in their old age as well. The story ends with them (literally) drifting off on a river together in their 70s. I'm sure you can see in my general tone about this book that I was not a big fan of it all in all. The story started off confusing me on who the main characters were supposed to be. It begins with Dr. Juvenal Urbino looking into the death of an old friend of his. The book goes into details about how it turns out that this dead man had a long time love affair with a woman no one suspected, and that he was actually living under an assumed name to avoid the law. You would think that this sort of detail and open-ended-ness would indicate that this dead man would be the main character, right? Nope. You learn almost nothing else about this man. The author does this several times - giving in depth, yet needless information about characters that turn out to have very little to do with the story at all. Also, I just can't get behind the whole "hopeless romantic" vibe he has going for Florentino Ariza. He is built up to be this great poet and lover, yet still very humble and always very unrealistic ... but he's supposed to be a successful businessman and juggle all these sexual relationships, always mentioning how great a love each was in his life. While I was reading the book, I called foul - it wasn't until after finishing the book and looking things up about it online that I found out that Marquez wrote the story about the love of his life and Florentino Ariza is supposed to be him. Now I understand why he played him up as such a great guy, but I still don't buy it. It's a big effort in self-aggrandizement as far as I'm concerned.